Another ride we've talked about and even showed you still pictures of is Tokyo Disneyland's "Pooh's Hunny Hunt" ride... well for those of you that can't yet afford to go there and would like to see it we have a special treat. WDI had originally proposed this type of project for the American parks, but the Suits weren't willing to pour this kind of money into it. The Oriental Land Company was, though... which is why they got the ride we all deserved and why we got the ride Eisner thought we would except. The reviews for "The Many Adventures of Winnie the Pooh" ride were lukewarm at best. Ironically, the lines for this ride are lukewarm at best as well. There were no four or five hour long waits for this attraction and there never will be. If this has been built in Disneyland we'd probably still have long lines to ride it just like in Tokyo. 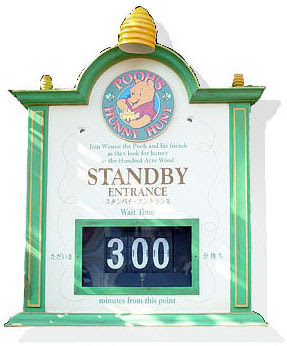 Now, we have to hope that Uncle John has taken a ride on "Pooh's Hunny Hunt" when he was at Tokyo Disneyland... and cross our fingers over a future rehab of the Anaheim or Orlando versions. Oh my! I can't believe how amazing that ride is!!! Why on earth can't we get something like this? I have only ridden Disneyland's Winnie the Pooh ride a couple times. If it was like this one I'd ride it everytime I go! Thanks for the links Honor! Although I was impressed with the 'trackless' ride vehicles, I don't think this technology is required to bring the stateside Poohs to a par with TDL. At least the Magic Kingdom got bouncing with Tigger vehicles. I so hope that they rehab our Pooh ride to look like this. Nothing can be worse then seeing/knowing what could be done. It makes it hard to accept any statements to the contrary by park management. Actually, what I find most interesting about Tokyo Disney is their "trackless" ride system. Pooh, and one of the rides in the Mermaid Lagoon seen yesterday, have systems where you don't actually see the track the vehicle takes. It would be nice if they would increase their use of this system here in the states. One of its biggest advantages? Wheelchair access. Right now, the loading area comes to a dead stop for Peter Pan, Small World, Many Adventures, etc. Worse still, the WHOLE RIDE (*everybody*) comes to a dead stop when doing a wheelchair load for Haunted Mansion and Buzz Lightyear. With a trackless system like on the Pooh ride seen here, it's possible to take a vehicle off the track to a special loading area and then run it back into line without any other guest being delayed. Curse you Eisner and Pressler! This is perhaps the most overrated attraction at TDL. I visited the park twice in 2001 and felt that this ride--after the hype I heard stateside--was a big yawn. As with much of TDS, it goes to prove that great ideas--not big budgets--are Disney's biggest x factor. Pooh is lacking in the great idea department. To me, it is a non-adventure with a big wallet. POOH! Well, Disneyland's version has 2 things going against it. 1)It's placed way in the back in Critter Country 2)It replaced Country Bear Jamboree, which doesn't sit too well with locals. DL's is a decent dark-ride, but something must be wrong with it because even though Splash's exit is near Pooh's entrance, the line is hardly full. However, I'm sure John Lasseter can see that the ride doesn't get the people it should which means there might be a higher chance of it being fixed. MK's version is another story. That's a real demonstration of budget cuts! It pales in comparison with DL's and it's just plain grotesque compared to TDL's. The problem with MK's though is that people go on it just to do it, so the line is usually full. That means Disney won't waste money on updating it. I too have ridden the Pooh attraction, but have a completely different opinion of it. I found it magical and amazing. Of course, if someone doesn't like Pooh then they may not like it, although my wife wasn't a fan of the animated film but loved the ride. We've rode it several times, which if you've been to TDR is very hard to do thanks to the lines. So we'll just have to agree to disagree on the Honey Hunt. Yeah, our ride cost 30 million compared with theirs. Hopefully Lasseter can get them to pony up another 30 million and they can make it look more like the ride... I don't expect the full 100 plus million, but they also would have to build certain things which are already in place. Maybe this is why Disney was recently seen checking out the trackless ride system used by a small them park in the North-West a couple months ago.